Western Technical College student Tyler Kenworthy knows what the power of an education can do. It’s what comes afterwards – the job search – that can be most challenging for students. Kenworthy is a second-year student in Western’s Business Management program. One of the final classes in the program, Professional Profile Development, requires the students to organize and plan the college’s annual Suits for Success event. Suits for Success began as an idea from instructor Shannon Corcoran five years ago, an idea she brought from her previous work at Rochester Community and Technical College. In 2008, during the economic downturn, Corcoran began a similar event, providing clothing for individuals who were recently unemployed. 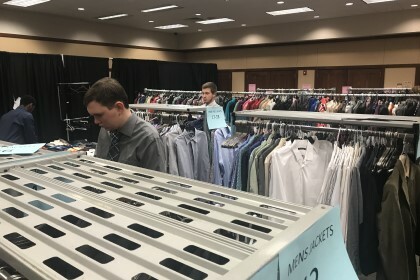 The event collaborates with area businesses to provide gently-used professional clothing to Western students and the public for free. In recent years, the event has grown, adding tie tying demonstrations, resume building, and the opportunity to have a professional photo taken. Collaboration is critical for the event, says Corcoran. Students in the class divide into small teams working on various aspects of the event, including marketing, donations, and logistics. The event helps students learn more about event planning, networking, inventory management, soft skills, and operations, providing a real-world experience in the classroom. Suits for Success is part of Western’s community engagement initiative, which takes credit-courses and uses them to address and solve community needs. It is a large and unique part of the educational experience at Western. In total, Western’s programs spend over 9,000 hours in community development projects. Some of the most visible work includes building homes for the City of La Crosse’s housing rehab program. Others, like computer training classes, seek to help the community become more affluent with technology. Just last month, Corcoran’s class was honored for their community impact at the Student Showcase event in Madison, hosted by the Wisconsin Technical College System. Kenworthy says the event was a great learning experience, not only in developing his organizational skills, but realizing the good he can do in the community. “It made me feel good that we are helping members of the community get to the next step and take pride in their career and professional appearance,” said Kenworthy. To learn more about Western’s community engagement program, visit www.westerntc.edu/communitiy-engagement.